Yes, YOU can acheive excellence in each and every football combine test. You see, when preparing for a football combine you need a master plan, and I am here to lead you to a plan for combine success. Imagine... One knockout combine performance could make your football career, one 40 yard dash, one jump, one shuttle. It could lead to a lucrative scholarship, professional contract or moving up int he NFL Draft which = millions of dollars. I am here to help you achieve this. Sounds to good to be true? If you have access to the lastest techniques for each test and have a specific protocol for each test you can achieve combine excellence. I now have all of the answers! Over the past seven years, the focus of my work has been to provide aspiring athletes and coaches the most cutting edge training techniques for football combines. I have achieved great results with my best selling “Pro Combine Preparation Manual” with thousands of athletes nationwide, all who have seen drastic changes in their 40 yard dash times, shuttles, vertical and broad jumps, along with their reps on the bench press. The Combine Freak Vol. 1 is over 70 minutes of detailed test technique with me doing all of the coaching and instruction on how to master the football combine tests. Unlike other combine training DVD’s out there I cover all of the combine tests, not just three or four. Each test is broken down step by step, phase by phase to ensure that you become the Combine Freak! In fact, there is so much test technique instruction in The Combine Freak Vol.1 that my friends and colleagues think I am crazy for giving away so much information and so many of my inside tips. I want you to have the definitive source, a how-to on the football combine tests, not just for 3 of the tests but for them all! With the Combine Freak Vol. 1 DVD you get my cutting edge training tips that has helped Colts RB Joseph Addai, Texans DT Amobi Okoye, Bears DE Mark Anderson, Eagles OG Scott Young, and Titans CB Reynaldo Hill become combine testing Freaks to name a few. here is what I accomplished with them. Jackie Battle - Cowboys - 4.38 sec. 40 yard dash at 238 lbs. I have helped these athletes becone testing freaks in front of the NFL Scouts, Now let me help you! This digitally mastered DVD is all about detail, the little details make the biggest difference in your combine preparation. I teach you all my secrets on how to prepare for the biggest job interview in football. You will get the how to's on everything you need to make serious improvements on your testing scores. In addition I include how to prepare the day before testing day, what to take, what to drink, what to wear, and how to be perceptive to how the combine is being run. 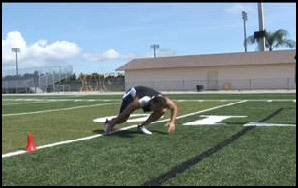 Joseph acheieved this result by executing perfect technique on his first step, something that he and Mike Gough worked relentlessly on in Florida during his NFL Combine preparations. If you are a athlete, coach, parent or trainer, now is the time to step up to the start line and get the most out of you combine testing. This mind-blowing DVD will change the way you look at the football combine tests. If you viewed this DVD after your combine testing, you may pick up a ton of technique refinements that could of have made you combine performance even better. Follow the detailed technique instruction and "Leave no stone unturned in your preparation." It's for the hard-working athlete who finds it difficult to improve they're combine testing scores. Truth is, what I have listed doesn't even scratch the surface of what you'll get in The Combine Freak Vol. 1! Once you start playing this detailed DVD you will be blown away with the content, that is content that gets results. So don't wait any longer to place your order. The first 250 orders will recieve this DVD at a special price of $59.97, once they are gone (very quickly) the price will go up. SO click the "order now" button right now! Or, if you'd prefer, pick up the phone and call 941.907.2288 and place your order on our secure voicemail. P.S. If you're the type of person who wants to perform at your highest level, this is the DVD for you. Again, this deal will not last long. This is a no-brainer. Order NOW!